These two great shots of two OBs were contributed by Michael who’s father is lucky enough to drive them for weddings. They are owned by Protours Douglas IOM who I know very little of but they do private hire so these nice little Bedfords could be kept quite busy. From another shot I have seen they did not have fleet numbers but were named instead 1949 was ‘Lady Meave’ and 1950 ‘Lady Roseen’. 1950 MN was originally owned by Bailey of Turvey, Bedfordshire and had the registration HTM 20 I wonder if 1949 was from the same operator. Michael also told me that 1950 MN appeared in ‘The Rotters Club’ film hence the route number and destination. Just as a matter of interest, the previous vehicle, 1949 MN, is now East Yorkshire 100, and is now registered SS 7376. According to PSV Circle records, the OB with East Yorkshire carried the registration 1949 MN from 6/86 until 8/88, which is when it was acquired by EYMS from the Isle of Man. It would appear that the registration 1949 MN has subsequently been reissued to another OB on the Isle of Man. Thanks for that one, Bob. The registration 1949 MN would, of course, stayed in the Isle of Man upon registration by East Yorkshire. It would be reasonable to assume that Protours would have re-used the mark, especially if the OB had come from the mainland. 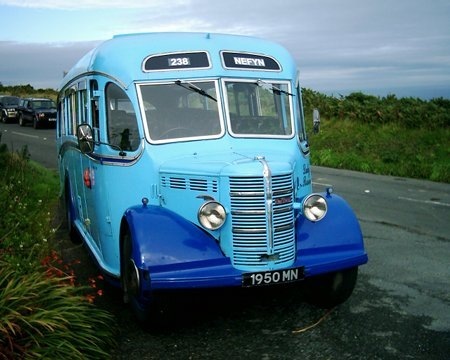 The current 1949 MN is I believe the one which was registered HTM 20 and came to the Isle of Man from Norman Boyes of Bradford who purchased it from Waby’s of Holme on Spalding Moor. It was delivered new to Bailey’s of Turvey. When I last saw it it was beginning to show signs of its original red and black colour scheme under its present coat of paint. My dad drove for Norman Boyes in the 60s, I remember these coaches, he had two complete ones but no idea what and if they were the same model, also another stripped and being restored, I remember the roofs being pulled back and also at least one had indicators that were arrow shaped on the back, great days going with dad during the school hols when there was a spare seat or two. Both OB’s 1949 MN (HTM 20) & 1950 MN (RHK 843) both left the IoM 9/15 & are currently in the ownership of Craig Porteous t/a Yorkshire Bus & Coach, Hull. The registration number HTM 20 was sold off prior to it going to IoM & is currently on a Nissan car, the replacement number being BVH 319M. So looks as though this will have to have a new age related number. RHK 843 is still ‘live’ at DVLA so should be available to be re-instated. RHK was new to Went, Boxted, Suffolk. Out of interest, I learned to drive and took my bus test (and passed first time) on a very similar Bedford OB in 1969 with Highlander Coaches from Douglas. Can’t recall the registration! I’m confused! I have slides (my own and bought ones) of vehicles marked as being in the fleet of TOURS (ISLE OF MAN). Two of those views (taken in 1998) are of 1950 MN, Lady Roseen. Another bought one is of a Bedford VAL in the fleet of CORKILL’S TOURS (ISLE OF MAN) and the views here are attributed to PROTOURS. Do we have mulitple operators with very similar names? All seem to be based in Douglas. I’d imagine that Michael would have a fairly good idea of which firm pays his father. Any suggestions, plese? I’ve just noticed that John Wakefield (25/12/15) fell in to a trap laid for those not familiar with the villages along the Essex / Suffolk border. RHK 843 was not new to "Went, Boxted, Suffolk" but to Went, Boxted, ESSEX", the two villages being some twenty miles apart. RHK 843 has a particular meaning for me as it was the first PSV I ever drove – well technically it wasn’t a PSV as it was preserved in Eastern National livery at the time. The next village to Boxted Suffolk is Stanstead which had its own bus related confusion circa 1970 when OK Motor Services of Bishops Auckland applied to run a service there. When they learnt of this, the local operator H.S.Theobald and Son wrote to OK saying that they would object strongly to the application but suggested that OK might instead like to run to Stansted, ESSEX where there was an airport! Many thanks for correcting me on the Boxted’s. Ironically it was only last Sunday when passing through Boxted SUFFOLK on board Felix of Long Melford OB(DBU889)that I made reference to Wents being there, only to be told they were at Boxted ESSEX. There must have been numerous times of confusion back in the day when Wents were trading. In fact the two Boxted’s are only 16 miles apart as the crow fly’s, to the North & South of Sudbury. This is ridiculous, Nigel. When I looked at Google maps to see where exactly these places are, the first name I spotted near Boxted Suffolk was Audley End, (all together now) not to be confused with Audley End in Essex! And of course there is also Hadleigh, Essex and Hadleigh, Suffolk. In the old days before postcodes we had to tell everyone to use Hadleigh, Ipswich in our address but my grandmother never did and her letters always seemed to get to us via Southend. It’s been mentioned before on these pages about how many different St Ives places there are. Cornwall, Dorset and Huntingdonshire spring to mind and there may be others. My outlaws live in Tiverton, Devon, but there’s another in Cheshire . . .
To answer Pete Davies question, Tours & Protours were basically the same company. Originally Tours, they became Protours when a South African firm of the same name headed by Fred Kinnear took them over. But in 2012 Kinnear pulled out & the firm passed back to its original owners Roy Lightfoot & John Guilford & reverted to Tours IoM Ltd. Corkhill’s were another IoM company who traded from Onchan. They ceased trading in the 1980’s I think. Corkill had an OB MMN 57 which later became YTF 162J on the mainland & is now in Holland last registered BE-02-31 operating with the Hotel Kasteel De Vanenburg, Putten. Ah, the confusion of the Hadleighs! When I worked in Hadleigh, Suffolk in the 1970s it was not uncommon for lorries to arrive at the industrial estate asking for the location of a company only to be told that they were 50 miles away from their destination in Hadleigh, Essex. However the worst confusion was related to me by a Hadleigh (Suffolk) haulier. He once sent a driver to pick up a load from Otley. Four hours later he got a call from a phone box in Otley, West Yorkshire with the driver saying he couldn’t find the address. Sadly, he should have gone to Otley, Suffolk which was thirty minutes from Hadleigh! His boss was not amused. A friend of mine lives in rural Kent, and is ever being accosted by confused car drivers asking where they can find the airport. He has to tell them that their route lies back over the Thames to Stansted Airport, as no airlines operate from Stansted, Kent. Some years ago, a driver set off from Peterborough on a private hire to Leeds Castle. No prizes for guessing where he actually went. One clue – it wasn’t Kent. There is a story about a truck driver asking the people in the post office at Portsmouth nr Todmorden. "How do I get to the harbour from here?" 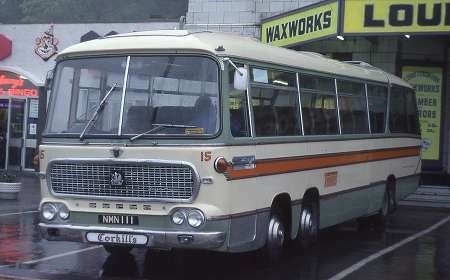 Corkills were a major constituent of Tours IoM which was an amalgamation of most of the Douglas operators in 1972. 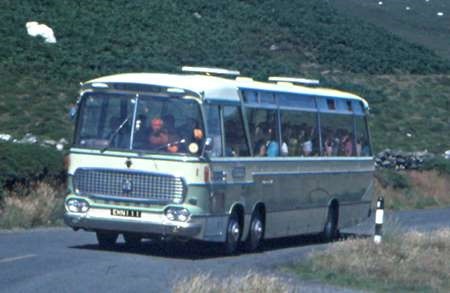 Tours was the trading name of the operation but most coaches carried corkills names until the mid 80s, the green livery was inherited from Corkills too. 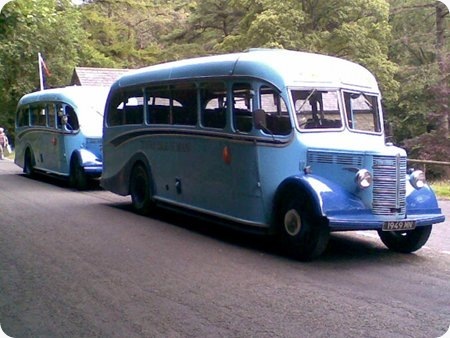 in the Mid 80s the business was reformed as Tours IoM ltd and changed to a blue based livery! Then it was sold to South African Protours, it has about 45 years ago been sold back to its management and trades as Tours IoM again. Here is Bedford VAL70 EMN 111 ex TGX 878F which was a Corkills coach and passed to the Tours operation, Corkills fleet were characterised by having 111 reg nos a practice continued by Tours. EMN is seen descending the Sloc into Port Erin on a round the island tour. photo credit to the late Greg Corrin. Both IoMan buses seen 25/10/16 in yard at Newport North Humberside awaiting sale? Both OB’s 1949 MN (BVH 319A) & 1950 MN (RHK 843) are now both owned by Craig Porteous of Hull. As far as I am aware they are not for sale or at least they were not a month ago. Both are now back on UK mainland reg numbers, BVH 319A was HTM 20 originally but that number was sold off (now on a car) when the coach went to IoM. Think you have been misinformed about the va ls they went to ireland the 2 vegamajors AKA the twins in 1979 and the viceroy in 1981.